Dr. Sonja first became passionate about dentistry while attending Sheldon High School, when she assisted her father, Dr. William B. Sproul, on a dental mission trip to Belize. Her interest in dentistry only grew throughout college at Seattle Pacific University, when she had the opportunity to travel to Africa as a dental assistant, and provided dental services to the people of Kenya. Although she attended Ostrow School of Dentistry of USC, Dr. Sonja remains a “Duck” at heart! 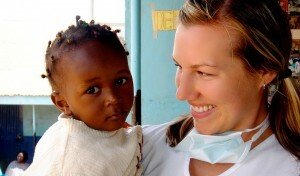 During dental school Dr. Sonja regularly volunteered for mobile clinics, which served children in the surrounding Los Angeles areas. 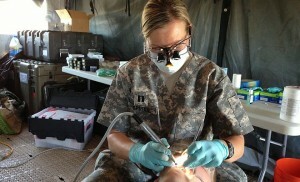 She was also able to provide dental services on a school humanitarian trip to Honduras. Dr. Sonja Sproul graduated with Dean’s list honors and faculty nominated awards for her leadership and excellence in clinical dentistry. While Dr. Sproul is pleased to be taking over her father’s family dental practice, she also enjoyed serving as a dentist in the Army National Guard from 2009-2018. In 2013, Dr. Sonja received The Army Commendation Medal for her service and support. 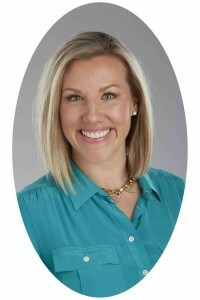 “One of the most rewarding aspects of being a dentist,” says Dr. Sonja, “is that I get to build long-term relationships with my patients and their families, while offering high-quality, personalized dental care.” Many patients have commented on her gentle touch and calm demeanor, which facilitates the office’s inviting atmosphere. Dr. Sonja served as an Executive Board member and President for the Lane County Dental Society for five years and is a member of the Exploring Excellence Study Club. In addition to staying up to date with the latest dental technology, she continues to provide dental services around the world, as her recent trip was spent over Christmas in Micronesia delivering free dental care to the people of Chuuk. Along with her passion for travel and spending time with her husband, Dr. Sonja enjoys skiing, hiking, scuba diving, and biking.